If you are aware of Ó Ruairc family history or folklore, including the variant spellings of O'Rourke Rourke, O'Rorke, Roark, Ruark, ..., share your story here. Bréifne - the Kingdom of O'Rourke. Ua Ruairc of Breifne - Kingdom and Rivalry, a summary history with links to the following articles. Early Lineage - ancient origins. Genealogical Sources - Sources used for determing lineage. Descent from Ruarc - Some of the descendants of Ruarc. Place-Names of Breifne - An outline of the septs and place names of Briefne. The Breifne Region - Tribes of the Breifne region, with a map circa 700. Kings of Breifne - Ó Ruairc Kings, Lords, and Chiefs. O'Dugan's Topographical Poem - describing the chiefs of the Breifne region. Russian Irish O'Rourkes - Count Joseph and others. Poems about O'Rourke - Prince of Breffni. Annals of the Four Masters - O'Ruairc excerpts recorded in the Irish Annals. More Irish Annals - Further O'Ruairc excerpts from the other Irish Annals. Kings of Connacht - The Uí Briúin kings, including a few O'Ruaircs. O'Rourkes in Griffith's Valuation - 19th century land-holders. Bréifne (or Breffny, Breffnie,...) was the Irish kingdom lead by the O'Rourke and O'Reilly septs up to the 17th century. Read more at Ua Ruairc of Bréifne. County Cavan formed part of the kingdom of Breifne, which included Leitrim, of which the O'Rourkes were princes. In later times Cavan, or East Bréifne, became distinctively Bréifne O'Reilly; and West Bréifne, or Leitrim, became Bréifne O'Rourke. Bréifne long resisted colonization by the Anglo-Normans, and the O'Reilly's of Cavan were not brought under permanent English rule until the late 16th century. Cavan, previously part of Connacht, was designated a part of Ulster in the early 17th century and included in the Ulster plantation from 1608 onward, when it was settled by Scots and English colonists. For a look at the location of Breifne among the other pre-Norman kingdoms of Ireland, as well as the Ua Ruairc (O'Rourkes) among the other dynastic surnames of Ireland, see this 1100 A.D. Map of Ireland. The O'Rourke line is descended from Briuin, a brother of Niall of the Nine Hostages, and a possible descendant of Conn of the Hundred Battles. See this for more information on early ancestry. In the tenth and eleventh centuries, the kingship of Connacht was held by three members of the O Rourke family. Their name is said to come from the Norse, Hrothrekr, which was Gaelicized to Ruairc. Until the confiscations by Cromwell, their chieftains were Kings of Bréifne - at that time composed of the Irish counties Leitrim and Cavan. The Bréifne O Rourkes ruled from Kells in County Meath to the northern tip of County Sligo. Noted for their hospitality, their stronghold was at Dromahair (the Ridge of the Two Air Demons) in County Leitrim. On the banks of the River Bonnet are the ruins of Bréifne Castle, another of the O Rourke Fortresses. In the O Rourke pedigrees there are nineteen chiefs, all called Tiernan. One famous Tiernan O Rourke (d. 1172), King of Bréifne, ravaged Meath in 1122 and then extended his warfare into Connacht, which was then O Brien and O Conor territory. Dermot MacMurrough Kavanagh, King of Leinster, who was also striving to subdue Connacht, encountered Tiernan's wife, Devorgilla, there. After an unusual affair between MacMurrough and Devorgilla lasting two years, O Rourke allied himself with O Conor, King of Connacht, and deposed MacMurrough. Dermot, who has never been forgiven by the Irish, sought the assistance of Henry II, King of England and France. Henry the II sent the Cambro-Normans to Ireland, which changed the course of history for Ireland. Tiernan was killed in 1172 by the Norman, Hugo de Lacy, and sent his head to Dublin to be impaled on a gate. Further reference on the Cambro-Norman Invasion of Ireland. Devorgilla lived until 1193, at age 85, while visiting the Abbey at Mellifont. She gave generously to the Cistercian Order, by donating a golden chalice and 60 ounces of fine gold to the Abbey at Mellifont, and by building the Nun's Church at the Abbey of Clonmacnoise. View photos of Mellifont here. View photos of Clonmacnoise here. Contributor: James R Sebastian Jr (from Ida Grehan's "Irish Family Histories"). O'Rourke comes from the Irish "O Ruairc", from Ruarc, a personal name derived from the Old Norse Hrothekr, meaning 'famous king'. The O'Rourkes were of the same stock as the O'Connors of Connacht, part of the large tribal grouping of the Ui Briain, claiming common descent from Brion, a fifth-century King of Connacht. The Ruarc from whom the surname derives was a ninth-century King of Bréifne, an area covering most of the modern counties of Leitrim and Cavan. The first to use his name as part of an hereditary surname was his grandson, Sean Fearghal O Ruairc, who died in 964. Over the following century and a half, four O'Rourkes were Kings of Connacht. After the twelfth century, they appear to have accepted the overlordship of the O'Connors, however reluctantly. They also had persistent problems with the other pre-eminent family of Bréifne, the O'Reillys, which ultimately resulted in their territory being much reduced. The main stronghold of the family was at Dromahair, on the shores of Lough Gill in Co Leitrim. In common with most of the other ruling families of Gaelic Ireland, the O'Rourkes lost all of their possessions in the great upheavals of the sixteenth and seventeenth centuries. Source: Excerpts from Virtual Retail. The Irish surname O'Rourke is an anglicized form of the Gaelic O'Ruairc. The prefix "O" signifies "grandson of" of "Descendant" and indicates the patronymic origin of the name, while Ruairc is derived from a Norse personal name. The O'Rourkes were one of the great princely families of Ireland. They were lords of Breffny and provided more than one king of Connacht in the period prior to the Norman invasion of 1170. See the Early Lineage of these kings. The ancient territory of Breffny comprises the modern day counties of Cavan and West Leitrim and the O'Rourkes held a vast tract of land there which, at its wildest, extended from Kells in County Meath to Sligo. After Cromwell, like all great Gaelic families, many O'Rourkes left the country. Some became military leaders in European countries; their descendants are still (or were until the Russian Revolution) among the important families in Russia and Poland. Joseph O'Rourke, Prince O'Rourke in the Russian aristocracy, was General-in-Chief of the Russian Empire in 1700 while two Owen O'Rourkes, both counts, served Maria Teresa of Austria from 1750-1780. Of those who went to France, a notable bearer of the name was Father Manus O'Rourke (1660-1741), who, during a lifetime as an exile, wrote voluminously in the Irish language. A notable bearer of the name in Ireland was Tiernan O'Rourke, Prince of Breffny (killed in battle 1172), who is best known on account of the repercussions which followed the carrying off of his wife, Devorgilla, by Dermot MacMurrough. BLAZON OF ARMS: Or two lions passant sable, one over the other. CREST: Out of an ancient Irish crown or an arm in armour erect grasping a sword proper pommel and hilt of the first. MOTTO: Serviendo Guberno. Translation: "I Govern By Serving"
Source: The Historical Research Center. In the 9th century, the chiefs of Ui Bruin Bréifne spread out into two counties, Leitrim and Cavan. The O'Rourkes gave three kings to the Ultonian throne during the 10th and 11th centuries. Like other Irish kings and nobility they steadily resisted the English takeover of their land up to the 17th century. After 1650, when the Cromwellian murders ceased, their leaders were sent into exile to foreign countries. They went as far away as Russia and Poland, where they were distinguished for their leadership. They also formed part of the Irish brigade in France. Like most Irish names coming from the Gaelic, O'Rourke is spelled in different ways: O'Ruairc, O'Rowarke, O'Rourke, O'Roarke, O'Rorke, Rourke, Rorke. The Gaelic motto for this family clan is "Uppermost" or "Victorious." The O'Rourke family was deeply involved in the clan wars. They fought against the O'Reillys, the O'Briens and the O'Connors. One of the clans was sent out of Ireland, and turned to King Henry II of England. It was an unwise choice, for shortly after, the Anglo-Normans attacked Ireland. The O'Rourke family is credited with helping many of the survivors of the Spanish Armada when they landed by accident off the coast of County Leitrim. Spanish sailors later married into the Celtic race, introducing the black-haired Irish. Because so many of the O'Rourkes went to Europe, we find their names appearing in Vienna. Count O'Rourke died there in 1786, after having fought for Russia against Prussia. The Irish O'Rourkes were members of the clergy in Russia. Even as late as the 20th century, an O'Rourke appears as the Bishop of Danzig. One of the great playwrights of Ireland was Edmund Falconer, born in Dublin in 1814. He spent most of his life in England, becoming manager of two famous theatres, The Lyceum and the Drury Lane. He wrote many plays, most often on Irish peasant life, not the life he knew in the upper classes. His real name was Edmund O'Rourke. Owen O'Rourke was created Baron O'Rourke on 24 May 1727 (Ireland), with remainder to heirs male of his body. This title regranted to him along with the Viscountcy of Breffney on 31 July 1731 (Ireland) with the same remainder, and regranted again with remainder. Failing heirs-male of his body, following Owen's death, the title went to his cousin-germaine Constantine O'Rourke, of Carha, and the heirs-male of his body, on July 1742. Constantine O'Rourke was recognized as Count by the Czarina Elizabeth of Russia on 15 Feb 1760 (this title confirmed for his descendants by Nicholas I, 15 Feb 1845). The identity of the present heir is unknown but there are many male line descendants; the last identifiable heir was Nicholas Nicolaievich O'Rourke, 9th Count O'Rourke, born 1898, and probably titular 10th Viscount of Breffney and 10th Baron O'Rourke. DROMAHAIRE, or Droim Ath Thiar (The Ridge of the Western Ford), was the stronghold of the O'Rourkes, and was established on a ridge on the north-eastern bank of the River Bonet during the Middle Ages. This was the site of Dromahair Castle, believed to have been built by Fhergal O'Rourke, who ruled 945-966. 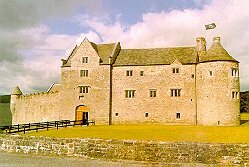 Nearby is a much altered stronghouse built in 1626 by Sir Edward Villiers to replace the original tower house of O'Rourke. The Villiers manor house has a main block 21m long by 10.6m wide of which the south wall is much ruined. The north wall is thick to contain staircases, fireplaces, and latrines, and has two wings each 6.8m wide projecting beyond it. From this spot, the O'Rourkes of Dromahaire dominated the region until 1603, after Brian (Battle Axe) O'Rourke was captured by Queen Elizabeth I's forces at Leitrim Village, and taken to London to be hanged. Other buildings (ruins) near this site include Creevelea Abbey (the 16th century O'Rourke Family Chapel), and also the O'Rourke Banquet Hall (see below). 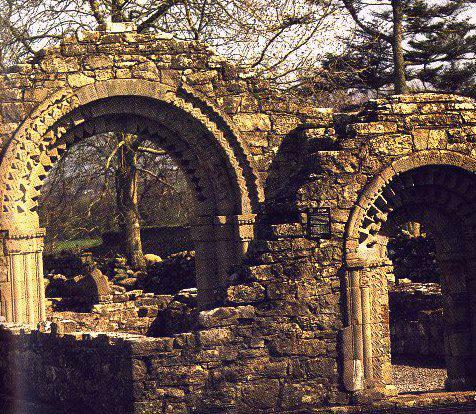 CREEVELEA "ABBEY" (national monument), a Franciscan Friary, was the last to be built in Ireland before the dissolution of the Monasteries (1535-39) in King Henry VII's time. It's benefactors were the local chieftain Eoghan O'Rourke and his wife Margaret O'Brien (daughter of Conor O'Brien) in 1508. It was consecrated in 1511 and, after their deaths, Margaret was interred there as was Eoghan in 1528. Accidently burned in 1536, it was partly restored by the founder's son Brian Ballach. It was unsuccessfully suppressed in 1539, the Friars retaining possession until 1598, though not without difficulty, for in 1590 Sir Richard Bingham stabled his horses in the Friary during pursuit of Brian Na Murtha (O'Rourke), for sheltering the Spanish survivors of the Armada. The Friars returned in 1601 and repaired the damaged buildings. In 1617 Captain Walter Harrison was granted its possession; he extracted exorbitant rent from the Friars and fees for burials. The Friars were again driven out in 1630 by Villiers, though they returned during the 1641 wars to be finally disbursed in 1649 to live in the surrounding countryside. Since then the Friary has been used as a place of burial, its fabric deteriorating until designated a National Monument, and becoming the responsibility of the Office of Public Works which has halted its decline. Sir Teigue O'Rourke (died 1605) was buried here, as was the Franciscan Thady O'Rourke, Bishop of Killala (died 1734) whose headstone was restored by Fr. Cormac McSherry, builder of St. Patrick's Church. View a picture of The Abbey of Creevelea, situated on the outskirts of Dromahaire village. Still visible today, The O'Rourke "BANQUETING HALL" was built and enlarged during the period in which the O'Rourkes enjoyed the height of their influence and power as rulers of Connaght, during the 10th and 11th centuries. It formed part of a well fortified complex which experienced the usual vicissitudes of those times, necessitating frequent repair and reconstruction over a period of six centuries. Hospitality was a much respected characteristic of the O'Rourkes; their feasts were legendary, and frequently featured in the poems and ballads of bygone bards. Dean Swift wrote a satire on one of these poems, which is better known today than the original. Below are the first two stanzas of a total of 22. Today, The O'Rourke Banqueting Hall has lain undisturbed for over 300 years (it is not open to public access). NEWTOWNE - Rediscovered in the 1970's, the O'Rourke lords of Breifne had built a tower house on a tongue of land at the (north) eastern end of Lough Gill. The foundation of the 16th century tower house, 9.5m wide by about 17m long, remain showing it to have stood off-center in a tall-walled five-sided bawn next to the lake, but enterable through a surviving gate-house on the eastern side. The tower house seems to have had thick walls containing chambers at each end, one of them having been built before the rest of the tower. 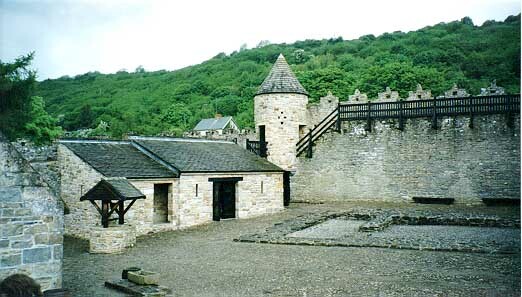 The tower house at the Castle of Newtowne, as it became to be known, was probably destroyed shortly after the execution of Sir Brian na Murtha O Ruairc in November, 1591. In the 1620's it was transferred to Captain Robert Parke who gained possession of the land and castle. Parke built for himself a three-story stronghouse within the original bawn, which conformed more to the Plantation style in vogue at the time. It incorporated an original round tower and the bawn gatehouse with narrow guard rooms on either side of a passage. The castle was captured for the Confederate Catholics by the O'Harts and in 1652, then still called Newtown, was surrendered to Sir Charles Coote. The last occupant of the castle was Robert Gore, son of Robert Parke's daughter Anne. Today the castle is known as Parke's Castle and is one of the few good examples of a 'planter castle' in the Republic of Ireland. CLONMACNOISE - the monastery in County Offaly is the site of O'Rourke's Tower, the larger of two round towers at the site. Fergal Ua Ruairc, King of Connacht from 956 to 966/67 is credited with the building of the Round Tower, though its upper portions were rebuilt after it was struck by lightning in 1135. The NUN'S CHURCH, is a partially restored, compact Romanesque church built in 1167 by Dervogilla, wife of Tighernan O'Rourke, King of Breifne. 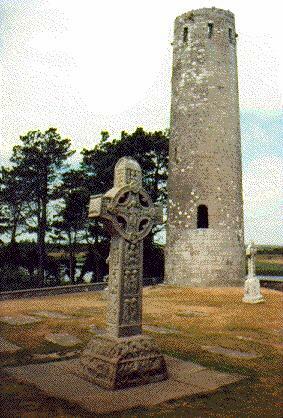 It is situated a quarter mile (400m) to the east of Clonmacnoise. The abduction of Dervogilla by Dermot MacMurrough is said to have led to the Norman invasion of Ireland (see "Turning Point" below). View a photo of one of the arches at the Nun's Church. 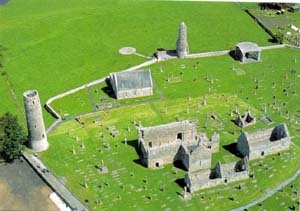 Also see an aerial view of Clonmacnoice. Tiernan O'Rourke & Dermott MacMurrough - The Great Feud. Brian O'Ruairc, mo rogha leannan, translated as 'Brian O'Roarke, my chosen darling'; was written about 1600 for a ceremony crowning Brian as king of the O'Roarkes. A 14th Century Poem, about the tribes and chieftains of Bréifne, during the reign of Tighernan O Ruairc.